1957 Nov 19 WCTU Meets Tuesday for Program on Alcoholism W.C.T.U. members met with Mrs. George C. Renaud on Tuesday, for a regular monthly meeting. Miss Eloise Kiester, vice-president, conducted the business meeting in the absence of Mrs. Harvey Mikel, president, who is spending the winter months in Arizona. 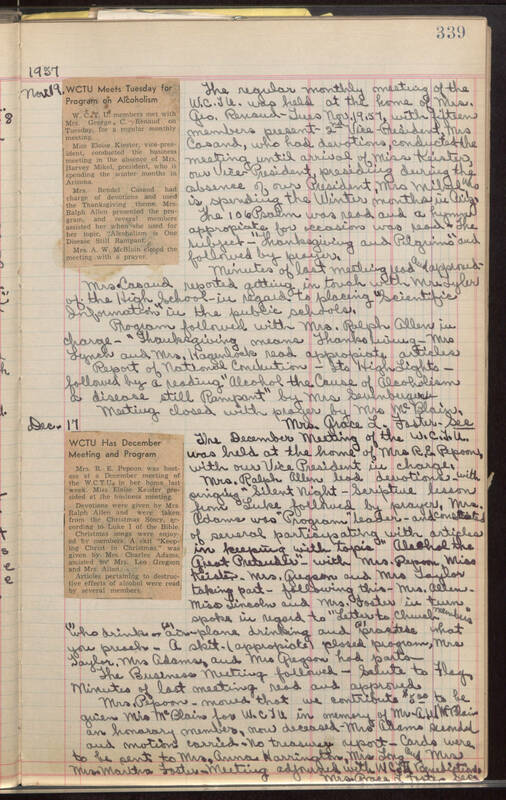 Mrs. Rendel Cosand had charge of devotions and used the Thanksgiving them. Mrs. Ralph Allen presented the program, and several members assister her when he used for her topic, "Alcoholism is One Disease Still Rampant." Mrs. A.W. McBlaiin closed the meeting with a prayer. The regular monthly meeting of the W.C.T.U. was held at the home of Mrs. Geo. Renaud - Tues Nov. 19,59, with fifteen members present - 2nd VicePresident, Mrs Cosand, who had devotions, conducted the meeting until arrival of Miss Keister, our Vice-President, presiding during the absence of our President, Mrs Mikel, who is spending the Winter months in Ariz. The 106 Psalm was read and a hymnal appropriate for occasions was read - the subject "Thanksgiving and Pilgrims" and followed by prayer. Minutes of last meeting read and approved. Mrs. Cosand reported getting in touch with Mrs. Tyler of the High School in regard to placing "Scientific Information" in the public schools. Program followed with Mrs. Ralph Allen in charge "Thanksgiving means Thanks living. Mrs Lynch and Mrs. Hagenlock read appropriate articles. Report of National Convention - Its High Lights - followed by a reading "Alcohol the Cause of Alcoholism a disease still Rampant" by Mrs. Seuenberger. Meeting closed with prayer by Mrs. McBlain. Mrs. Grace L. Foster, Sec Dec. 17 WCTU Has December Meeting and Program Mrs. R.E. Pepoon was hostess at a December meeting of the W.C.T.U. in her home last week. Miss Eloise Keister presided at the business meeting. Devotions were given by Mrs. Ralph Allen and were taken from the Christmas Story, according to Luke 1 of the Bible. Christmas songs were enjoyed by members. A skit "Keeping Christ in Christmas," was given by Mrs. Charles Adams, assisted by Mrs. Leo Gregson and Mrs. Allen. Articles pertaining to destructive effects of alcohol were read by several members. The December Meeting of the W.C.T.U. was held at the home of Mrs. R.W. Pepoon, with our Vice President in charge. Mrs. Ralph Allen lead devotions with singing "Silent Night - Scripture lesson from Luke followed by prayer. Mrs. Adams was "Program" leader and consisted of several participating with articles in keeping with topic "Alcohol the Great Pretender' - with Mrs. Pepoon, Miss Keister, Mrs. Gregson and Mrs. Taylor taking part - following this - Mrs. Allen, Miss Lincoln and Mrs. Foster in turn spoke in regard to "Letter to Church Members" (1) who drinks on (2) airplane drinking and (3) practice what you preach. A skit (appropriate) closed program, Mrs Taylor, Mrs Adams, and Mrs Gregson had parts. The Business Meeting followed Salute to Flag. Minutes of last meeting read and approved. Mrs. Pepoon moved that we contribute $5.00 to be given Mrs. McBlain for W.C.T.U. in memory of Mr. Abel McBlain an honory member, now deceased Mrs Adams seconded and motion carried. No treasury report. Cards were to the sent to Mrs. Anna Harrington, Mrs. Long and Mrs Mrs. Martha Foster. Meeting adjournded with W.C.T.U. Benediction. Mrs. Grace L. Foster, Sec.